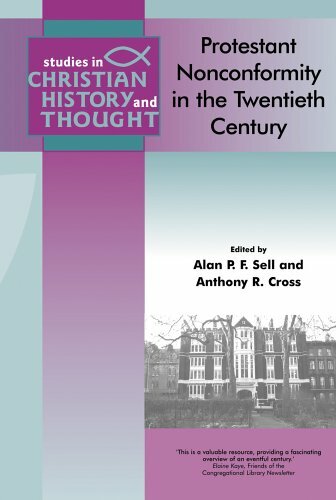 Alan P. F. Sell and Anthony R. Cross (eds. ), Protestant Nonconformity in the Twentieth Century (Milton Keynes: Paternoster, 2003). x + 398 pages. ISBN: 978 1 84227 221 3. Review copy courtesy of Paternoster/Authentic Books. This book, edited by Alan Sell and Anthony Cross, is another worthy addition to what is an excellent series of Studies in Christian History and Thought, a series comprising monographs, revised dissertations, and collections of papers which explore the church’s witness through history. The series includes some important contributions to scholarship, among which is David Wright’s Infant Baptism In Historical Perspective, Byung Ho Moon’s Christ the Mediator of the Law: Calvin’s Christological Understanding of the Law as the Rule of Living and Life-giving, and David Bebbington’s brilliant 1998 Didsbury Lectures, Holiness In Nineteenth-Century England. Protestant Nonconformity in the Twentieth Century is a collection of papers presented at the second conference of The Association of Denominational Historical Societies and Cognate Libraries, held at Westhill College, Birmingham, in July 2000. The result is twelve papers from scholars representing a number of Nonconformist traditions which invite reflection on Nonconformist contributions to biblical studies, theology, worship, evangelism, spirituality, and ecumenism during the twentieth century. Other essays I particularly valued were David Bebbington’s, ‘Evangelism and Spirituality in Twentieth-Century Protestant Nonconformity’, and ‘Protestant Nonconformist Attitudes towards the First World War’, by Alan Ruston. Ruston, who is editor of the Transactions of the Unitarian Historical Society, surveys how WWI witnessed Nonconformist churches becoming increasingly part of the establishment, particularly in attitude. They became, he writes, ‘an integral element within the political machine in almost the same terms as the established church. But flying into the sun in this way burnt their wings and like Icarus they fell to the sea. They did not drown like Icarus but the weakness engendered by the war remained with them for the rest of the century’ (p. 240). Ruston’s contribution to this volume is a powerful reminder of how voluntaryist assumptions about church, state and society inform Nonconformist contributions to religious, social and political life. Those who identify themselves with the Nonconformist family, and those with an interest in (particularly early) Twentieth Century theology and history would be well served by reading this book. it will be nice to read this book….